Malate Literary Folio, the official literary and visual arts publication of De La Salle University-Manila is inviting everyone to its annual celebration of the Filipino language entitled “Reinkarnasyon ng Salita.” Alongside with this, the first issue book of Malate will also be launched. 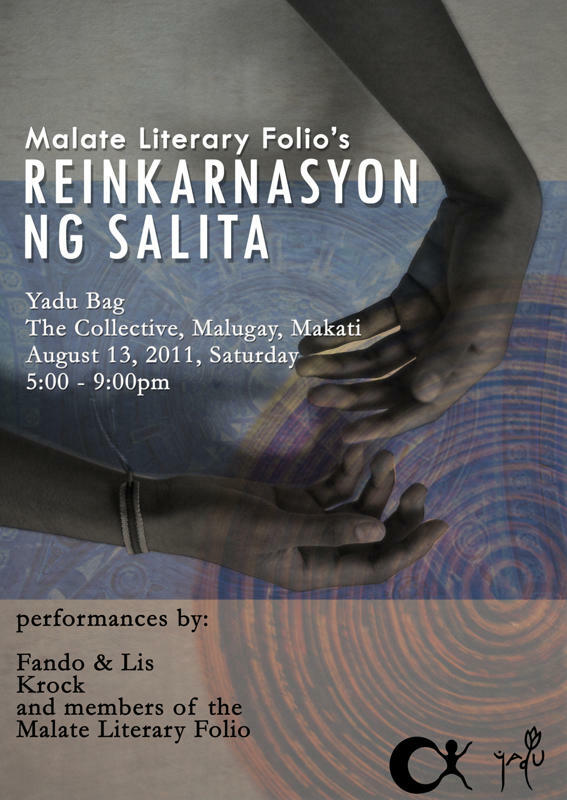 It will be held on August 13, 2011, Saturday at Yadu Bag, The Collective, Malugay St. Makati. Reinkarnasyon ng Salita is Malate’s own way of celebrating the Buwan ng Wika. Through this celebration, Malate expresses its pride in the Filipino culture through readings of different literary pieces and a showcase of the visual artworks published in the current folio. The event would also feature performances by the members of Malate, bands like Krock and Fando & Lis and many more. A guest speaker would also be invited to share his/her expertise and opinions regarding the state of the Filipino language today. For more info, you may contact Challen Ng Chua thru +63.915.3487649 or +63.923.8691640. The event is open to all who wish to attend, and there is no door charge.